SPOILER ALERT! If you haven't watched the season finale of Downton Abbey, stop reading and go watch it ASAP! 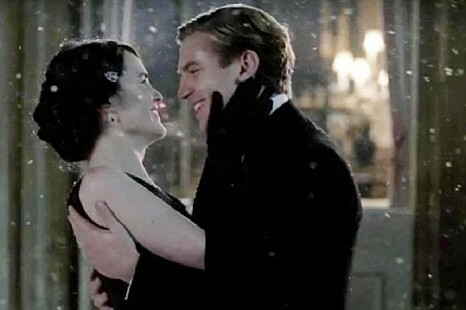 And then there's Cousin Matthew and Lady Mary. I told Jared after the Bates' verdict that Matthew and Mary HAD to get together... they can't kill off Bates AND continue to drag out the Matthew and Mary will-they-or-won't-they saga. It's just too mean. Thankfully, Julian Fellowes took pity on my poor heart and gave us all the proposal we've been waiting for. But, really Mary? Insisting that Matthew get down on one knee and ask you properly? You're lucky he's asking at all! Not only do you NOT have to marry Sir Richard and all his douchebaggery, but you get to marry the future Earl of Grantham, an all around great guy and war hero, and someone who loves you in spite of the Mr. Pamuk debacle. Count your lucky stars, say yes, and help your former parapalegic future husband up off the ground before he hurts himself. Sheesh. Those of you who watched - what did you think of the finale? ?